I am so pleased to feature a new book by my friend and fellow author, Ruth L. Snyder. 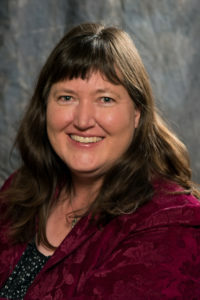 Ruth is the past president of InScribe Christian Writers’ Fellowship and is now taking more time to pursue her own writing – a worthy endeavour as you will see from this interview and my review. 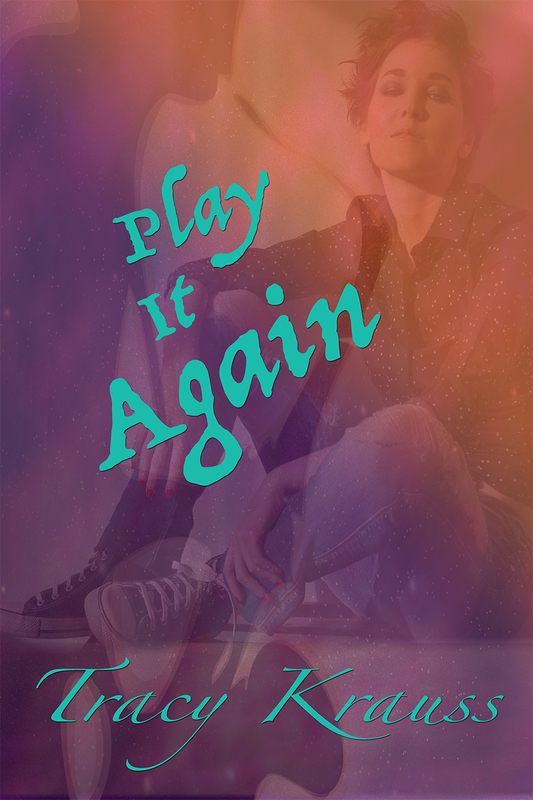 I’ve read the book twice – once as a beta reader and again now that it has been published. This is one of those books that you will want to keep on your shelf to reread. Can you explain the inspiration for this book? The main inspiration for this book came from God working in my life. I knew the basics about spiritual warfare, but in the past few years God gave me some very practical lessons—a prodigal daughter, marriage struggles, and my dad living with dementia. There were days I felt like I could barely breathe, let alone deal with the realities of life. God provided a prayer team and they supported me as I learned to lean on my Heavenly Father in new ways. 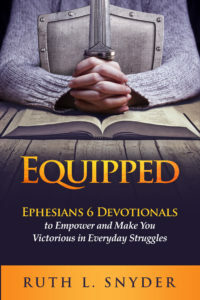 When the difficulties were resolved (except for the dementia), God prompted me to write a devotional book based on Ephesians 6:10-18. What was your main motivation for writing it? To be honest, I resisted writing it at first. I knew that if I tackled this topic, I, along with my family, would become spiritual targets. However, God continued to prompt me, and I decided to obey. So I guess my main motivation would be obedience to God. What were some of the struggles you faced when writing this book? Along with the usual struggles writers face (getting distracted, shortage of time, technology issues), I faced unexpected challenges in our family, in my work with InScribe Christian Writers’ Fellowship, and burnout. When my first editor read the manuscript, she encouraged me to put it away for a while. I just wanted to be done with it. I had a good cry, and put away the manuscript. God encouraged me (through people) to just rest for a season (as much as is possible when you have children with special needs). I was ready to tackle revisions after about six months. The time of rest was absolutely necessary and the book is definitely stronger than it would have been a year ago. How has God been equipping you in your ministry as a writer? As a woman? As a mother? In any other areas of life? As a Christian writer, God has been equipping me by teaching me to dig deeper into God’s word and pray. I pray about my writing, during my writing, and also pray for those who read what I write. Personally, God has been equipping me by helping me learn how to be still and listen to His voice, to pace myself better, and also how to practice self-care. I cannot minister to others from an empty tank. God has also shown me I can minister more effectively when I am willing to be vulnerable. This world can be a difficult place, and people are looking for answers. When I share my struggles and how God brought me through, others listen and learn. I tend to be more of a Martha personality—a doer. God is equipping me to be a better mother by reminding me to just walk beside my children and be with them. I am learning to enjoy precious times with them instead of becoming frustrated when they interrupt my train of thought. God has also blessed us with our first grandchild. He loves when I sing and play with him, and I look forward to learning more with and from him. Please give us some insight into your background. How did growing up as a ‘missionary kid’ equip you for the future? I was six weeks old when my parents left North America. I learned the value of reading and writing through hearing my mother read letters from relatives and friends in North America. (At that time, there was not internet or email. We waited weeks or months for letters to cross the ocean.) I accepted Jesus Christ as my Lord and Saviour while we were in South Africa. I learned many spiritual lessons by watching my parents and being involved in ministry with them. They talked about the power of Satan evidenced in daily life around us, but they also demonstrated how to pray and gain victory through God’s power. When I was eight, I attended school five hundred miles away from my parents. My faith grew by leaps and bounds, and my writing skills were also honed as I wrote letters to my parents. What do you hope to see accomplished through this book? Who will benefit from reading it? It is my prayer that women will be equipped for daily victory. So often we drift through life, forgetting that we are in a battle. God has provided everything we need to live fruitful, effective lives. My target audience for this book is Christian women, ages 30 – 60, although others will benefit as well. Do you have any other written work that you would like to share? After this book is launched, I will be working on several other projects including revising a book teaching people how to use Twitter, a short Christmas story set in Botswana, and a short devotional I wrote for parents. Eventually I would also like to finish a novel I started a few years ago. This devotional book written by Ruth L. Snyder is a little gem. 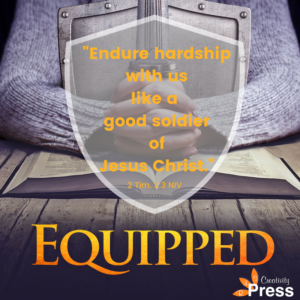 The author has experienced first hand some of the attacks of the enemy, but has also risen victorious through tenaciously sticking with God and relying on His word. This book is packed with actionable advice, relatable anecdotes, and above all, a solid foundation in the Word of God. It is a practical and encouraging addition to any library on spiritual warfare. Each section digs deep, starting with God and who He is, then moving on to describe our enemy, Satan. This helps to define and ‘debunk’, exposing our own fears and misconceptions – not negating the power and influence of darkness, but allowing us to understand our enemy so that we can take specific and tactical measures against his wiles. The book moves on to practical steps for all Christians and goes into detail about the armor of God, the passage upon which the book is built. Each chapter and section are well documented with scripture references and there are many helpful resources at the end of the book, too, useful for future reference or to expand on what is already given. This isn’t the kind of book that one can sit down and read in one or two sittings. It is a book to be read piece by piece, mulling over each part in order to internalize the truths within. I see this book as a handbook to spiritual warfare written in a no nonsense and readable style that should be on the shelf in every Christian home and church.